Hydroid, Inc. a Kongsberg Maritime subsidiary, announced today that they had delivered a new deep-diving Autonomous Underwater Vehicle (AUV) to the Woods Hole Oceanographic Institution (WHOI) for use by the US Navy. The REMUS 6000 AUV, as it’s name suggests, is capable of diving to depths of up to 6,000 meters and was designed under a cooperative program involving the Naval Oceanographic Office (NAVOCEANO), the Office of Naval Research (ONR) and WHOI in support of deep-water autonomous operations. “Our engineers and technicians will develop and install system enhancements to the standard vehicle, as well as perform system testing prior to delivery to the Navy,” said Tom Austin, principal engineer at WHOI. 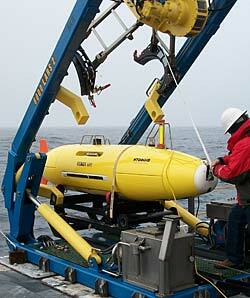 Although the vehicle was purchased by WHOI as the primary AUV platform for new sensor and system integration enhancing NAVOCEANO capability for Navy missions, the ultimate end user for this REMUS 6000 is NAVOCEANO, which acquires and analyzes global ocean and littoral data and provides specialized and operationally significant products and services to all elements within the Department of Defense.